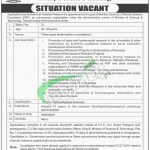 Here you will enjoy the latest vacancy news from Pakistan Science Foundation PSF Jobs 2017 Ministry of Science & Technology. Applications are invited from the Pakistani Nationals through Pakistan Science Foundation PSF Islamabad is inviting the well disciplined, caliber and dynamic applicants for the single vacancy of (Member Science) is the post which needs to be filled with overall qualification of Ph.D in Natural and Applied Science with atleast 17 years expertise in the relevant fields teaching/Research/planning/ administration is required to apply. Appointment will be made on tenure basis for the period of 3 years which will be extended further on account of satisfactory performance. Age limit should be 42-55 year's is required. The organization reserves the right to stop the recruitment process at any stage and also to increase or decrease the number of vacancies. Attractive salary package of BPS-17 will be given to the applicants. So, only suitable candidates meeting criteria should apply as per the following how to apply procedure given below. Application along with copies of educational and experience certificates, CNIC, Domicile, two recent passport size photograph along with CV should be submitted to the said address. Last Date for submission of application is 2nd October 2017. Personally sent applications will not be entertained. Only qualified candidates from written test will be allowed to appear for interview. For more quality jobs please stay in touch with us at JobsAlert.pk. Address: Section Officer (Org-02), Ministry of Science & Technology, Plot No, 01, Constitution Avenue, Sector G-5/2, Islamabad.